with Archie Rose Distilling Co.
As a team of passionate new world distillers, Archie Rose Distilling Co. is dedicated to honouring Sydney’s rich spirit-making past, and shaping its future with the launch of the first independent distillery in the City of Sydney in over a century and a half. Located within 5km of the CBD, Archie Rose distils Gin, Vodka, Rye Whisky and Single Malt Whisky to be shared in good company and good favour alike. In this unique and hands on session, you will have the opportunity to blend two of your own gins which are yours to take away in 200ml flasks. A gin & tonic on arrival will start the evening before our Venue Manager Harriet guides you through our distillery and the gin making process. Instruction will be provided on how to construct a high quality spirit as well as a little history on gin itself. This is a rare opportunity limited to 24 gin lovers to create their very own gin according to their taste! Your passion for all things Gin! About Harriet Leigh & Archie Rose Distilling Co. This session will be led by Harriet Leigh, a renowned spirits and cocktail authority who has led countless tastings, spirits trainings, and large-scale events. 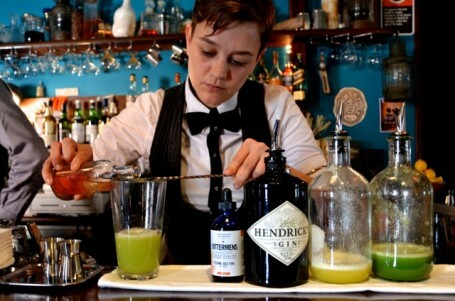 With a passion for flavour and the spirits industry, Harriet is the ideal guide to walk you through what you are tasting and deliver an entertaining evening. On occasion, our Founder, Will Edwards, Head Distiller, Joe Dinsmoor, and Assistant Distiller, may pop their head in to lend a hand or simply to taste some of your special gins!